Without doubt, one of the biggest highlights of the 2014 Classic TT presented by Bennetts will be the unique 'Joey Dunlop Road Racing Legend - the Rivals' Parade Lap sponsored by the Isle of Man Steam Packet Company, which will feature some of his greatest rivals. With Dunlop having won a record-breaking 26 races at the Isle of Man TT, 26 of his major rivals from his career have been selected to be part of the parade lap, all of whom will ride machinery from their era of racing. Jim Dunlop, Joey's brother, will also be appearing on an ex Joey Dunlop race bike to represent his brother. The riders have been carefully chosen by event promoters the Isle of Man Government Department of Economic Development and are riders who were involved in what were felt to have been Joey's most memorable races or those riders who were his main rivals for a sustained period during his career. The riders will leave the line in single file and in chronological order to a narration read by Manx Radio TT Anchorman Tim Glover, which will tell the story of Joey Dunlop's remarkable career through the rivalries that defined it. Throughout the 1970s, Ray McCullough was the man to beat in Northern Ireland and was one of the riders Joey aspired to both beat and emulate, something that he ultimately did. Dunlop's Armoy Armada and McCullough's Dromara Destroyers became the thing of folklore as they battled across the length and breadth of Ireland. Honours were pretty even between the two and McCullough will be represented by his nephew Denis, who enjoyed a successful road racing career himself, having many a battle with Joey in the 125cc and 250cc classes. The second of the Dromara Destroyers, Steele was a 250cc and 350cc class specialist and although he didn't reach the heights on the International stage like others did, he was a formidable competitor on the National roads of his homeland, winning countless races. The second member of the Armoy Armada, Mervyn was the rider who Joey looked up to most and their battles on the track never affected their close friendship. When Mervyn, who married Joey's sister Helen, lost his life at the 1980 North West 200, it almost led Joey to quit but he went to the TT and famously won that year's Classic race with the rest, as they say, history. Son Paul, a former North West 200 winner, will represent Mervyn. 'Big Frank', as he was affectionately known, was a car salesman by trade but a formidable member of the Armoy Armada with his moment of glory coming at the 1976 North West 200 when he placed second on the British-built Sparton. The Amoy man died in 1979, six months after being seriously injured at that year's North West 200 and brother Bill, now the organiser of the Armoy Road Races, will ride an RG500 Suzuki in his memory. Tom Herron was a few years down the line in terms of success compared to Joey, but occasionally their paths crossed, primarily at the International road races and having been successful in GPs Herron was the benchmark for all aspiring Irish riders. He lost his life at the 1979 North West 200, ironically a meeting when Joey really came to the fore on the International scene with a double victory in the 1000cc races, and so former team-mate Steve Parrish will represent him on Steve Wheatman's RG680cc Suzuki. Bangor's Cull went head to head with Joey at both the Irish National road races and Internationals for close to 15 years with the duo often battling for the lead, no matter what the size of machine. The 1988 season was particularly close with Cull getting the better of Dunlop at that year's North West 200, taking a hat-trick, before the pair fought tooth and nail in the Senior TT, where Cull claimed the outright lap record before being forced to retire. Cull, who retired due to injury in 1991, will ride another of Wheatman's RG500 Suzuki's. Another Bangor resident, McClements had a hugely successful career on the roads, particularly on his famous black 1000cc Suzuki, and was a rival to Joey for over a decade. The duo had many a battle, with Sam joining Joey on the podium in the 1985 F1 TT race and he was still winning races in 1989 when he lost his life in a crash at the Carrowdore 100. Countryman Ryan Farquhar, riding an RC30 Honda, will represent him. A specialist in the smaller classes, Williams encountered Dunlop at all of the International road races, immediately finding him a formidable opponent. Although Williams retired in 1984, the 250cc TT race of that year saw him, and Graeme McGregor, battle all the way until the end, the Australian winning from Charlie as Joey retired on the final lap. Williams will ride his own TZ350 Yamaha. The third member of the rival 'Dromara Destroyers' clan, Reid was one of Dunlop's longest rivals, primarily in the 250cc division, right up until 1994 when he was forced to retire due to injury. The pair had countless battles in both the National and International road races, the 1985 and 1988 250cc races at the TT being particularly memorable and Reid pushed Dunlop as hard as anyone did in his career. He defeated his fellow countryman on many occasions and lines up on a replica of his 1992 250cc Loctite Yamaha, owned by John McGuinness. Grant and Dunlop raced against each other for more than a decade and were always on opposite sides, riding for different teams and at different times. Their races from 1980 onwards were, arguably their closest, Dunlop famously beating the works Honda of Grant in the 1980 Classic TT and whilst he then moved to Honda, Grant left to go to Suzuki and their rivalry in the F1 class continued right up until Grant retired at the end of 1985. He lines up on an XR34 from the Team Classic Suzuki stable. Crosby's road racing career in the UK only spanned three years, 1979 to 1981, but for two of those years - 1980 and 1981 - he was a works Heron Suzuki rider and fought hard with Dunlop who was briefly his team-mate at the end of 1980 when he helped the Kiwi clinch that year's World F1 Championship. The 1981 Classic TT was their fiercest race as they both blitzed the outright lap record, Crosby lapping only 0.8s slower than Dunlop. He won the race, his third TT, and lines up on the Suzuki XR69 on which he was so successful. Like Crosby, McElnea's career overlapped Dunlop's for only a short period of time with the Humbersider and his Suzuki pitting his wits and talent against that of Dunlop and his Honda. 1983 and 1984 were the main two years, particularly in the F1 World Championship although the most memorable race was the 1984 Senior TT where the lead changed hands on numerous occasions with both smashing the outright lap record, moving it from 116mph to 118mph. McElnea will ride the same Suzuki XR41 he rode in 1983, the machine now owned by Steve Wheatman. Iddon wasn't renowned for being a road racer but two years with the Skoal Bandit Suzuki team saw him perform superbly with 1986 seeing him just miss out on the World F1 Championship, finishing second overall behind Joey. He was well to the fore again in 1987 and he'll ride a Suzuki XR41, similar to what he did back then. The 1986 season was when Joey and Robinson enjoyed some great battles in the World F1 Championship, Dunlop on the Honda and Robinson the Suzuki, particularly at the Dutch TT and Ulster GP. Robinson won the latter and looked like he could challenge Dunlop more than anyone but he tragically lost his life at Scarborough that same year. Current Northern Irish road race star Jamie Hamilton will take his place in the parade lap on board one of Wheatman's RG500's. Runner-up in the 1979 500cc World Championship, Ferrari was the man who brought to an end Joey's six-year run of being F1 World Champion in 1987 and did so by not contesting a single road race. The Italian rider famously walked out of that year's Ulster GP but won the majority of the short circuit races that formed part of the calendar to deny Joey a seventh world title. With Ferrari a regrettable late withdrawal from the event former British and World Superbike Champion Neil Hodgson, who was previously managed in the Ducati factory team by the Italian, will ride the Bimota YB4 that Ferrari rode to World Championship success. McGladdery was one of the leading privateer's in the 1980s, both on the short circuits and roads, and he was an almost ever-present in the World F1 Championship, regularly contesting the podium positions and standing alongside Joey on more than one occasion. Sadly, he lost his life last year in a road accident and so brother Geoff will take part in the lap on the 'Growler' Kawasaki that Andy made his name. Marshall and Dunlop were team-mates at Honda for four years, from 1983 to 1986, and they regularly battled for the race wins at the International road races, the 1984 F1 and 1986 Senior TT races being particularly memorable. However, it's perhaps the 1984 World F1 Championship where their rivalry was at its strongest with the pair level on points going into the final round. Dunlop ultimately prevailed as Marshall was forced to retire with a blown head gasket and although he's absent this weekend on BSB duty, fellow Lincolnshire rider Gary Johnson takes his place on a Honda NS500. Initially a leading exponent on 125, 250 and 350cc machinery, Huddersfield's Mellor went the four-stroke route in 1986 and a year later, he pushed Dunlop harder than anyone in the TT races that year. The Heron Suzuki rider was a formidable opponent and could win on any bike and at any track so his death in 1989 was a huge blow to the sport. Former team-mate James Whitham will ride a GSXR750 Suzuki in his memory. Joey's younger brother carved out an incredibly successful career for himself and as Joey was returning from injury in late 1989/early 1990, Robert's career was very much in the ascendancy with International road race wins coming in the 125cc, 250cc and Superbike classes. There was no quarter ever asked or given in their contests but the two siblings were always the greatest of friends and there was no bigger fan of Joey than Robert. Youngest son Michael will represent him in the lap, riding an original JPS Norton from the National Motorcycle Museum. Before going on to become the most successful rider in the history of the World Superbike Championship, Fogarty was a regular rival to Dunlop none more so than in the World F1 Championship between 1988 and 1990. The duo became friends in '88 despite the Blackburn rider denying Dunlop another world title, going on to win it himself three years in a row. The three-time TT winner won all those races on a Honda RC30 and will ride the same type of bike in the Parade lap. Hislop was inspired to ride at the TT after seeing Joey and Norman Brown in action during the 1983 event and just five years later, he was a double TT winner and standing alongside Dunlop on the 1988 Senior TT podium. Joey immediately identified Hizzy as the man to beat and although injury to Joey robbed us of seeing some scintillating head-to-head battles, their rivalry remained and saw them line-up as team-mates on numerous occasions. Steve Plater, like Hislop a former Honda factory rider and close friend of the Scot, will represent Hislop on a 1994 Honda RC45. Another rider whose career overlapped that of Joey's for more than a decade, Welshman Lougher was undeniably one of Dunlop's biggest rivals in the 125cc and 250cc classes. The duo were always contesting the race lead at the International road races with honours fairly even and Lougher will take part in the parade lap on a TZ250 Yamaha, a machine on which he had so many great results. When Dunlop got injured at the beginning of 1989, it was McCallen who he recommended take over his rides at that year's TT and the duo would become team-mates for the next ten years with honours, more often than not, shared. McCallen tended to have the edge on the 750s whilst Joey turned the tables in the Lightweight class and they were often battling for the lead at all of the International road races. Joey's final team-mate, McGuinness had five main years of competition against him, from the 1996 North West 200 up until the 2000 Senior TT. It was always McGuinness' ambition to stand alongside Joey on a TT podium, something he did for the first time in 1997, and they became regular sparring partners and friends. John rides his own RS250 Honda, a replica of his 1999 Lightweight TT-winning bike. 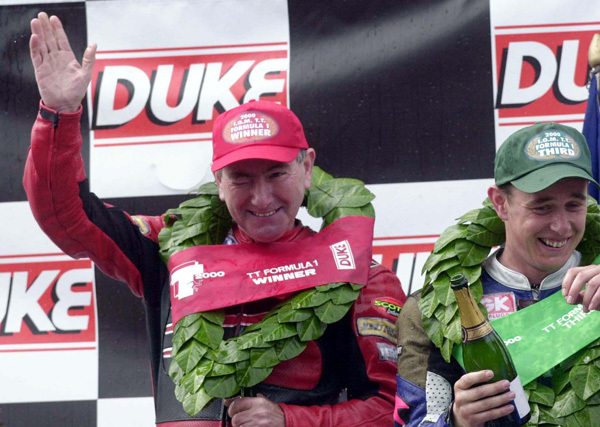 Although their road racing careers overlapped only briefly, David Jefferies and Joey Dunlop enjoyed some titanic battles, most notably at the TT in 1999 and 2000 and the Ulster GP of 1999. Honours were pretty much even between the two and Dunlop won a brilliant 1999 Ulster GP race to remind the youngster he was still very much at the top of his game. Jefferies' uncle, Nick, will ride in his honour on the famous V&M R1 Yamaha. Joey Dunlop (represented by Jim Dunlop) Needs no introduction - the 26 time TT Race winner, including 'hat-tricks' in 1985, 1988 and 2000. Voted the fifth greatest motorcycling icon ever by Motorcycle News in 2005 also won 24 Ulster Grand Prix races and five consecutive World Championship titles from 1982 to 1986. Awarded the MBE in 1986 for services to Sport and the OBE in 1996 for his work with children in Romanian orphanages. Cookstown/BE Racing owner and manager John Burrows was the first to admit that his team didn't set the world alight at the Cookstown 100 road races which were staged in front of a bumper Tyrone crowd, but Burrows believes that the seeds of success were definitely sown and he was in a positive frame of mind as the Tandragee meeting came up on the horizon.